Here we have domestic releases of the consummate Krautrock band’s early albums. Though not as quotable to neo-Kraut hipsters as Can, Faust, Kraftwerk and Neu! 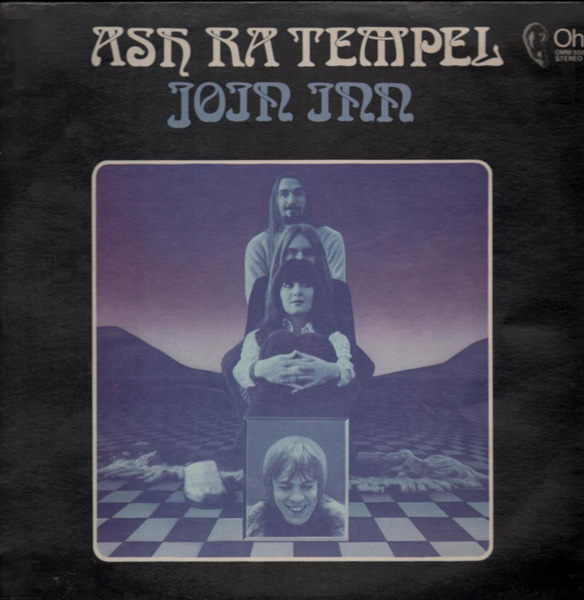 — Ash Ra Tempel were perhaps even more pioneering in the search of experimental music forms from the heyday of the Berlin scene. They seamlessly combined electronics, psychedelic and rock to the most extreme and radical while somehow interjecting a serene state throughout. So with these treasures in hand, Purple Pyramid have dropped the ball and decided to go the budget route and offer 2-for-1’s instead of doing what most would’ve preferred: A cleaner sound than the original Spalax CD’s. Also inexplicably, the label in their infinite daftness, have decided so far not to issue Ash Ra Tempel’s colossal debut — an album that has left many a jaw dropped and would be in this writer’s Top Five of Eternity. What we are left with, though, are three fantastic albums and one marginal one. They are paired logically, though that may not seem obvious at first. Schwingungen, ART’s second, is a vastly underrated album. The controversy here surrounds on what one thinks of John L., ART’s one and only vocalizer ("singer" just isn’t appropriate). He is, to say the least, Krautrock’s supreme example of a paranoid schizophrenic. For those familiar with the LSD ramblings of Dawn on Brainticket’s Cottonwood Hill, then John L. is her male equivalent. Seven Up, conversely, is ART’s most overrated album. This is in part due to two elements: 1) Drug culture icon Timothy Leary’s involvement and 2) The dropping of acid into the band members 7-Up. While that might sound radical up front, Seven Up is quite tame compared to the first three monsters. The first montage is a medley of electronics and drugged reworks of pop hits of the 50s and 60s. Unique? Yes. Satisfying? No. Here we have the connection, another version of the spacey “Suche and Liebe” from Schwingungen. This version, called “Time,” which contains a different opening, is pretty good — but not overly moving — and you get the impression the band’s ready for bed after partaking in too much alternative nutrition. The other disc’s connection is Manuel Göttsching’s lovely girlfriend Rosi Mueller. Join Inn, their third studio release, sees Klaus Schulze back in the saddle. On this album he provides less drums and more keyboards than on the debut. “Jenseits” is ART’s crowning spacial moment. Here, Schulze shows his brilliance with electronics — laying down a trancey locust-at-night sound while Hartmut Enke defines what a bass guitar can do for space music. Göttsching’s guitar just shimmers and flows. But the highlight here has to be Rosi’s seductive yet fragile and innocent voice whispering on top. I have absolutely no idea what she’s talking about — which adds to the exoticism and mystery for non-German speakers. Afterwards Hartmut Enke pulled a bad trip, Schulze went on to solo fame and Göttsching was left with the name and his girlfriend. So.... we have Starring Rosi, another unjustly panned ART album. Manuel had to recruit producer Dieter Dierks for bass duty and the Cosmic Couriers long-time drummer stand-in, Wallenstein’s Harald Grosskopf. And so the music is just completely different from the emotional workouts of the previous three. The mood is lighter and freer — and it sounds like Manuel and Rosi are having a fun date. Through it all we have Rosi’s lovely spoken voice (this time in English) and a little ill-advised singing from Manuel (something he fortunately gave up quickly). Overall a very pleasant and unique Krautrock album. One can only hope that Purple Pyramid will wise up and release the debut album with the original fold-out-in-the-middle gimmix cover — and better sound. As well — a revisit to Manuel Göttsching’s pioneering work Inventions for Electric Guitar, the last album to use the Tempel moniker, would be nice. Hopefully it too will be released with some care. In many ways Join Inn could be seen as the first Ash Ra Tempel Mk II. It too had a side of intense psychedelic rock and a side bliss-out, all apparently created during the recording of Walter Wegmuller's brilliant Tarot. In fact "Freak n' Roll" is perfectly named, and although it was recorded a couple years later that sense of wild abandon and over the top acid intensity seems to have been polished a little. Nonetheless it still has the period feel of having no limits or self consciousness and it rocks hard. On the other hand "Jenseits" may have really benefitted from the experience of the musicians. It is a psychedelic soundworld of cosmic beauty with Rosi Muller's vocals floating ethereally on top and just like so many of the other albums on the same label at the time like Tarot itself, Cosmic Jokers, Galactic Supermarket and the like, it was created by a lot of studio effects and wizardry. It also followed Ash Ra Tempel's perhaps less successful but relatively more famous collaboration with Timothy Leary, which had to have been a massive influence on the proceedings. It's interesting to think that two or three years after the psychedelic movement had calmed down in the US and Britain that is was alive and well in mainland Europe.